Senators Rob McColley and Bob Peterson, with the support of Senate President Larry Obhof and Senator Steve Wilson, introduce bill to cut unnecessary state regulations. 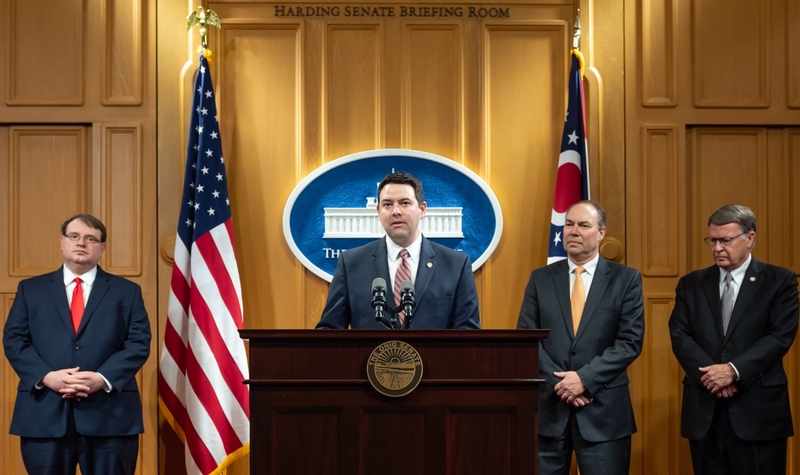 COLUMBUS—State Senators Rob McColley (R-Napoleon) and Bob Peterson (R-Washington Court House) today announced their legislation to eliminate red tape by reducing burdensome regulations, bringing Ohio more in line with national averages. The bill aims to address concerns raised at a recent press conference, where the Mercatus Center shared the results of their study of the regulatory environments of 22 states as part of its ongoing “State RegData” project. They concluded that with 246,852 restrictions, Ohio is one of the most heavily regulated states they have analyzed, trailing only New York and Illinois, and far surpassing the neighboring states of Michigan, Pennsylvania, Kentucky and West Virginia. "It is clear that Ohio is not doing everything it can to foster a pro-growth regulatory environment," said McColley. "The time and money that a business owner spends complying with unnecessary and burdensome restrictions will be better spent expanding their business, increasing productivity and creating new jobs." Provisions of the bill will require a 10 percent reduction of regulatory restrictions each year for three years by the agencies. If agencies are unable to meet the 30 percent requirement, a "2-for-1" strategy would be implemented where two regulations must be eliminated for each new regulation created. Additionally, the Joint Committee on Agency Rule Review would be required to release an annual report to inventory current and new restrictions across the state. The report will contain data from each state agency outlining the regulatory reductions for each agency and the percentage by which those agencies have reduced their regulatory footprint. To view the full press conference, visit the Ohio Channel by clicking here. The Mercatus study "A Snapshot of Ohio Regulation in 2018" can be found here. The Mercatus study "A Snapshot of Ohio Regulation in 2018" can be found here.